Movingtruckrental.net continues on its search for the perfect place to live, and we still have our sights set on Florida. There are so many great places to live in Florida, that it can be really difficult to choose which places better than the next. We have been asking many users which place they think is the best. Many people that choose to move to Florida, choose to do so so that they can enjoy a laid back tropical lifestyle, but there are some cities in the state where this lifestyle is more popular. Movingtruckrental.net heads to the streets of Miami to see if Miami is a great place to call home. Miami is much different than other big cities. The mixture of cultures in Miami makes it a very unique place to live. Most people choose to wear flip flops and shorts. It has a laid back tropical attitude that is hard to ignore. Miami is home to many vacationers, and some of them find it next to impossible to leave. Falling in love with Miami is not very difficult. Miami is a big city in terms of population, but not in size. The city of Miami takes up just over 55 square miles of land and water. 35 square miles of it is land, and 19 square miles of it is water. The population in Miami is just over 400,000 people. That makes Miami pretty crowded. There are just over 12,000 people per square mile. Miami is located in Dade County. Dade County is the eighth most populated county in the entire United States. Just over 2.5 million people live in Dade County. Miami is popular, and it is crowded. If you are looking for a nice quiet beach town, you might want to look somewhere else. Miami does have beautiful beaches, but they are often extremely crowded with people. The cost of living in Miami is not all that high. Dinner for two at a midrange restaurant will cost right around 50 bucks. A meal at a fast food restaurant will cost just under seven dollars. You can expect to pay right around three dollars for a loaf of bread, and a dozen eggs will run you right around $2.50. Chicken breasts will cost right around four dollars per pound, and fresh fruit like apples and oranges will cost right around two dollars per pound. There is more to the cost of living than just food. Here are the costs of some of the other expenses that you will face in Miami. The average monthly utility bill is a little over $200. You can expect it to be much higher during the summer months because it gets hot in Miami. If you were to rent a three bedroom apartment in the city of Miami, you can expect to pay right around $2500 per month. That same exact apartment outside of the city, will cost you right around $2000 per month. The average monthly salary after taxes is right around $2700 per month, and the average mortgage rate is right around 5%. Miami is affordable, and it is a great place to call home. 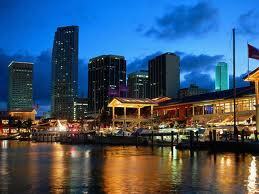 If you are unsure about Miami, the best bet would be to have a vacation in Miami. This way you will know whether or not you will enjoy everything that Miami has to offer. << Is Fort Myers The Right Place For You To Call Home?